MONKEYS ARE MY FRIEND: Do I Love My KA Switch Interchangeables? Last month, I bought a set of the KA Switch 2” interchangeables. I've knit two pair of socks with them now, so I think I'm ready to give my official opinion: two thumbs up... with a caveat. First off, I’m really glad I bought this set. I LOVE knitting socks on 9” circs. For me, it is the perfect way to knit socks. But while I love having this set, I'm not completely in love with the needles. Since they are bamboo, they are a little grippier than my oh so perfect HiyaHiyas. These needles also have the size cut into the shaft of the needle. Really convenient to easily see what size everything is, but the small edges created by the imprints create a little extra drag and, with more difficult yarns, can snag a bit. This wasn't an issue for the orange socks I made; in fact the needles felt a bit silkier after knitting a sock in that yarn. But the purple pair above was a different story. I don't know if it was because that yarn was 25% nylon with the superwash wool (instead of 10% buffalo, like the orange socks) but boy, the needles ended up grippy and snaggy. A bit more than half way through the socks, I waxed the needles with some beeswax with really helped but that didn't seem to last on one of the needles. So I need to figure out a better bamboo moisturizer to help with that issue. Even during the worst of the snagging, though, they never got to, say, Clover level of rough grippiness. The second issue, not as big of a deal, is the dullness of the needle points. Honestly, they aren't dull compared to other bamboo needles, but compared to my HiyaHiya Sharps... yeah. Knitting with bowling balls. But for those used to knitting with bamboo, it's not going to be an issue. Those more into wood or metal needles, though, will notice the difference. Grippiness(/snagging), dull points and inflexible cables are the only non-positives of this set. I don't think the last one is really a negative since other factors cancel it out and cable rigidity tends to be a personal preference. I also accept that dullness just comes with bamboo needles. Which leaves me with the only unhappy aspect of these needles being the grip/snag. So yeah, I'm going to work on finding just the right type of wax to smooth these puppies out but it's not going to stop me from using these. Even with the worst of the snagging, it was better knitting with these than it was magic looping or doing two circs at a time. DPNs would have been fine but I like being able to attach a longer cable to try socks on while knitting and I just can't get a DPN-filled sock on my foot. So even snaggy 9" circs win all day long. Bottom line: I am not in love with the needles but I am in love with having 9” interchangeables, if you get the distinction. 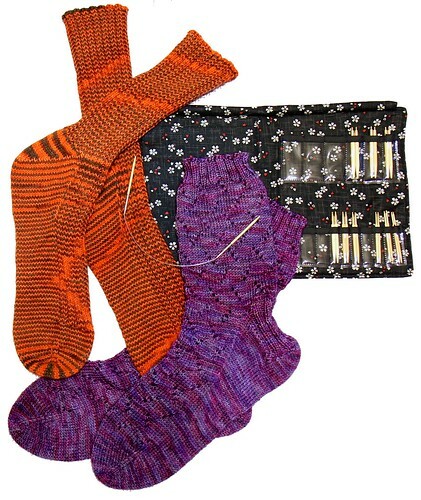 I do really like the needles, though more so when knitting with things like the orange yarn, not the purple. Of course, if HiyaHiya came out with a set of US0 and up 2” interchangeables, I’d drop these babies like a bad habit. But as I don't think that's going to happen any time soon, I'm going to keep knitting with these (and enjoying it). As a side note: As of May this year, KA is switching their smallest sized connector from an M1.6 to an M1.8. So if anyone decides to get any KAs that have needles for the smallest sized connector, make sure to clarify with the vendor what size they are. Last news I had, KA will be discontinuing the M1.6, making any broken or lost needles (or accessories) hard to replace and there are no current converters on the market (from M1.6 to M1.8). Also, when I was trying to buy this set, KA was in the middle of the conversion which caused several vendors problems in getting all the accessories I wanted (cable connectors, end caps, extra needles) in the M1.8 size. I ended up contacting The Mannings who went above and beyond and were completely awesome by getting me everything I wanted in the new M1.8 size and in time for my vacation. Kudos to them! I highly recommend emailing them if anyone is looking for a great place to get KA products. Seriously awesome folks. (Especially when three other vendors gave me some version of the brush off when they figured out what I was looking for!) Yay for the Mannings! And yay for 9" interchangeable needle sets! The KA Switch Short set review is right here! I'd be happy if this happened. A few months ago, I purchased a fixed pair of Hiya Hiya 9" sharp needles (size 0.) I've used them off and on but earlier today, I pulled them out and started knitting with them. I really like the 9" needles! I'm not sure what I'll use them for (yet.) Perhaps I'll make doll clothes for my daughter's Monster High dolls? I've really like knitting socks, gloves and mittens, two at a time. I like doing socks TAAT, too - I feel it makes them more consistent. But I've gotten annoyed with pulling the cables and doing all the adjustments for magic loop and two circs. So now I just do two socks, each on their own 9" circ and alternate between the two! :) Now if only I could get 9" HH interchangeables! I haven't TAAT with two circulars (yet.) I'm still firmly holding onto just using one circ. I thought about using two 9" circs and alternating between the two, but still haven't done that -- at least not yet! I must say, I'm happy to see your review on these needles, I specially popped by your site to see how you liked your 9" needles and didn't have to ask since you wrote a review about them. Have you seen the Signature convertibles? I wish they made them like the Interchangeable needles. I still might purchase one to see how I like them. Even though I like Signature needles, they still can't replace my beloved Hiya Hiya needles! I have only seen the Signatures online, not in person. Honestly, I kinda get it as they are more flexible than just straight up fixed circs, but they have nowhere near the flexibility I want from a proper interchangeable, so I'm just sort of meh about them.